And we’re off! Monday night’s Gotham Awards ushered us into the next phase of the Oscars season, in which the picks and prognostications are occasionally interrupted by something resembling actual awards. Like Iowa and New Hampshire, the Gothams take pride in being the first to pass judgment on the field, but they’ve never been the easiest indicators of future Oscars success. Only independent films are eligible, and voting is restricted to a handful of small jury panels. The choices tend to be idiosyncratic, and that’s the way the Gothams like it: They’d rather plant a flag for someone like Bel Powley in Diary of a Teenage Girl, who won Best Actress three years ago, than try to predict the eventual Academy Award winners. Still, as my predecessor used to say, it never hurts to be seen winning something, and if you break out your magnifying glass, you can divine some trends from the Gothams tea leaves. In between a lengthy speech from Sandra Lee, who won the “Made in New York” award, and a hirsute Michael Sheen giving a fiery tribute to Rachel Weisz as if he were John Brown at Harpers Ferry, the Gothams did indeed hand out some trophies last night. Here’s what we learned about the race from this year’s results. First Reformed has some weight behind it. Unlike some ceremonies I could name, Gothams don’t go crazy giving out awards in a million different categories. (They don’t even have a Best Director prize!) The night’s big winners were Eighth Grade and First Reformed, each of which won a whopping two trophies: Best Breakthrough Actor and Best Breakthrough Director for the former, Best Screenplay and Best Actor for the latter. Of the two A24 films, I think Paul Schrader’s dour religious drama might see the bigger boost. (As we saw last year with Lady Bird and The Big Sick, Oscar voters have an unfortunate habit of turning up their noses at bittersweet comedies.) Schrader’s been considered a lock for the Best Screenplay race, but if the love continues, he could sneak into Best Director as well. 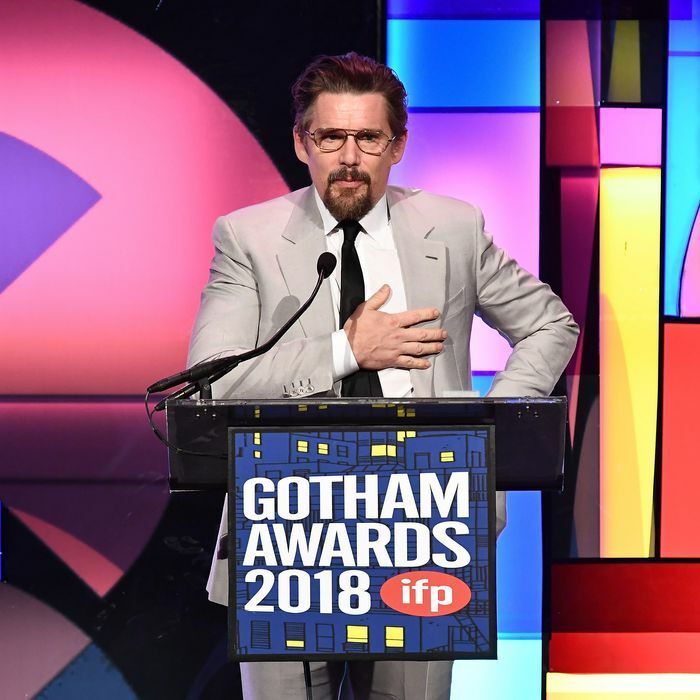 And Ethan Hawke seems to be pulling away from Willem Dafoe (who wasn’t nominated for At Eternity’s Gate, but did receive a standing ovation during his career-achievement tribute) in the indie lane of the Best Actor race. Good news for Toni Collette, bad news for Glenn Close. Collette’s Best Actress win for Hereditary was the Gothams at their most Gotham-y, shining a spotlight on a performance voters might be inclined to overlook and saying, “Yes, this is an awards movie.” The Australian actress still has a lot of ground to make up to crack Oscar’s final five, but at the very least, she’s doing what she needs to do. (Another win at the New York Film Critics Circle Awards later this week could be incredibly helpful.) It’s a disappointing result for The Wife’s Glenn Close, who unlike Collette was in attendance Monday night. As the early season front-runner, sweeping these early prizes could have given her an air of inevitability, but failing to pull out a win in a field that lacked Lady Gaga and Olivia Colman isn’t a great look for the oft-nominated Close, who’s hoping to secure her first Oscar next February. Won’t You Be My Neighbor? stays strong. The highest-grossing documentary of the year didn’t take home Best Documentary at the Gothams; that honor went to RaMell Ross’s Hale County This Morning, This Evening, an impressionistic look at black life in rural Alabama. But the Mister Rogers doc got another treat that was just as sweet, winning the ceremony’s Audience Award in a field comprised of the 15 films nominated in Best Feature, Best Documentary, and Best Breakthrough Director. As the category with the biggest voting population, the Audience Award is the one bit of the Gothams you can be confident predicts actual voter sentiment, and this win seems another indication that the movie’s portrayal of Fred Rogers’s kindness and human decency is resonating right now for, uh, obvious reasons. The indie crowd hasn’t united around a single movie yet. The night’s biggest surprise came at the very end, when Chloe Zhao’s The Rider unexpectedly triumphed in the Best Feature category. (In a typical bit of Gothams weirdness, the film competed in last year’s Independent Spirit Awards.) The prize doesn’t always overlap with Oscar’s picks: Four times in the past decade has the Gothams winner also won Best Picture, and four times has it not even been nominated. Beloved though it is, The Rider seems likely to fall in the latter camp, though Monday’s result will surely inspire more voters to take another look at it. At the risk of overinterpreting, its win can instead be seen as a lack of overwhelming support for any of the indies thought to be big players in this year’s awards race: If Beale Street Could Talk, The Favourite, and Roma, all of which went home empty-handed in the competitive races. (Besides Weisz’s career-achievement tribute, the three women of The Favourite also received a Special Jury Prize.) They’re all probably going to be fine, but it’s worth noting that in previous years, Get Out, Lady Bird, and Moonlight all got crucial momentum boosts from the Gothams. Maybe this year’s jury simply decided to honor a tiny film that would have otherwise gone ignored this season, or maybe we’ll look back on this as the first sign of weakness in one of the ostensible contenders. As always, it’s helpful to remember the rule of GGG: Gothams Gonna Gotham.